So last month I was looking through Cratejoy, a site that basically complies all the monthly crates you can order in one spot, when I found an entire section for witches and pagans. Needless to say I was overjoyed. I have been trying to order a Sabbat Box for years now to no avail. I have yet to make it off the waiting list so finding there are other options available was great news. In comes the Box of Shadows. This particular box has three levels: The Initiate, The Priestess, and The Supreme. Kind of reminds me of AHS: Coven. Each varies in price and offers a differing array of items. 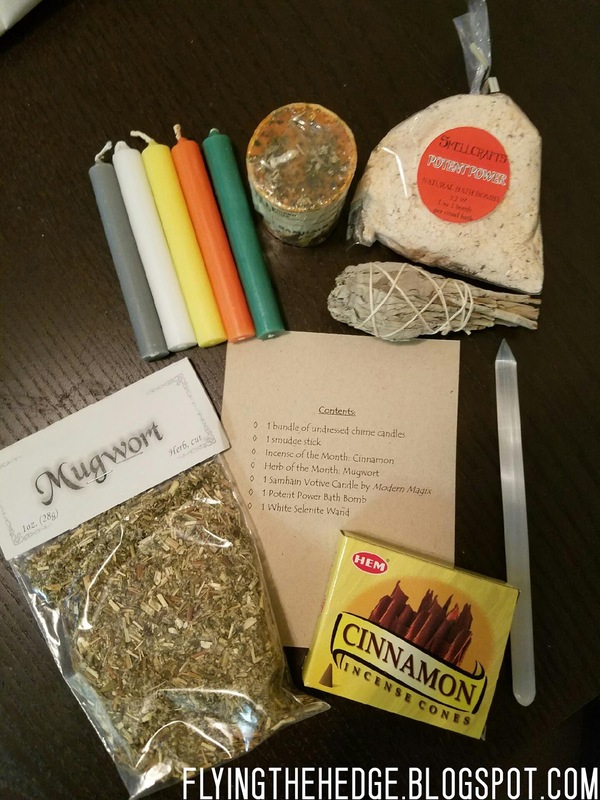 The Initiate, the box I ended up ordering, comes with an incense and herb or gemstone of the month, a smudge stick, a bundle of 5 undressed candles, and up to three surprise worship items. The Priestess and Supreme offer the same basics, but you get more surprise worship items (up to 4 or 5), and both the herb and gemstone of the month. I ordered my box last month and had somewhat forgotten about it until it arrived yesterday. I'm not going to lie, I had a truly terrible day yesterday so seeing this little beauty show up was a blessing. It immediately changed my mood and actually got my husband and I talking about my spirituality. We are going to Atlanta Pagan Pride this Saturday and I am hesitant because my husband tends to unconsciously look down upon my spirituality. The box sparked a pretty good conversation where he, for the first time, seemed pretty open to what I had to tell him. Anyway, this is a conversation for another time. My lovely box on my table. I have to say, taking a picture before opening it was hard. I just wanted to dive right in. 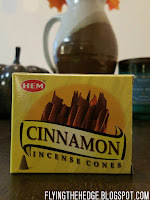 Upon first opening it the smell of cinnamon, cloves, and mugwort flooded the room. I knew instantly this was a box I was going to enjoy. 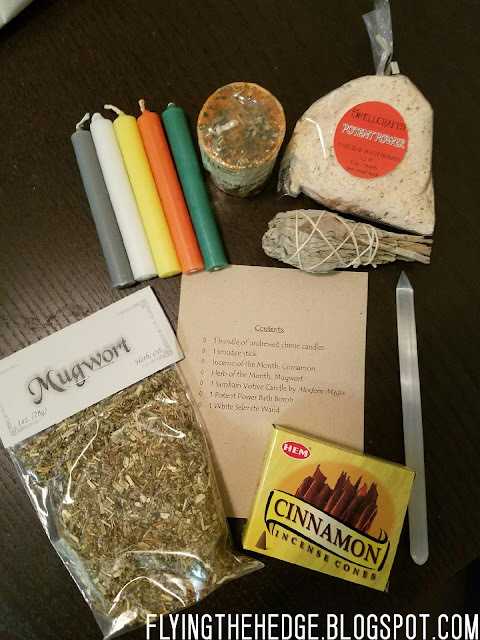 The box included cinnamon incense, a Samhain candle, mugwort, a bundle of sage, 5 beautiful candles, a ritual bath mix that smells AMAZING, and a selenite wand. 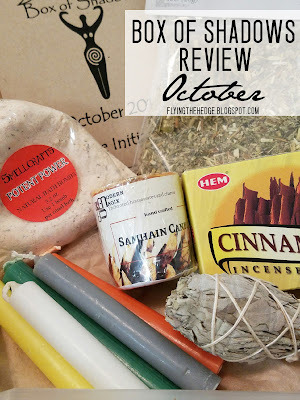 I think I am most excited about the Samhain candle and the ritual bath mix. 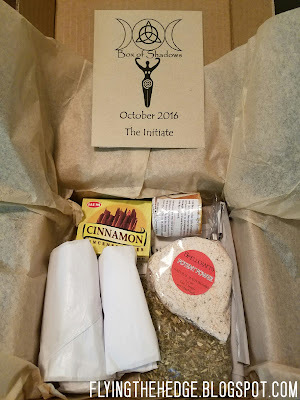 I am VERY satisfied with my first box and look forward to seeing what comes in November! Even the cats were excited over this box. I had to immediately hide the mugwort because Thanatos was trying to rip open the bag. For those of you who don't know, mugwort is similar to catnip. Keep it away from them. I'm always hesitant to subscribe to a box, because I never know if I'm going to enjoy what I receive, so this is a huge relief. That looks good and I'm seriously considering taking a chance on it. Thanks for taking the plunge! If all else fails, it is simply $20 in ritual supplies. 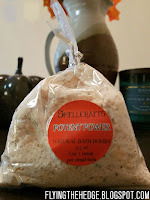 I already have a ton of mugwort, but I'm not going to turn down more! 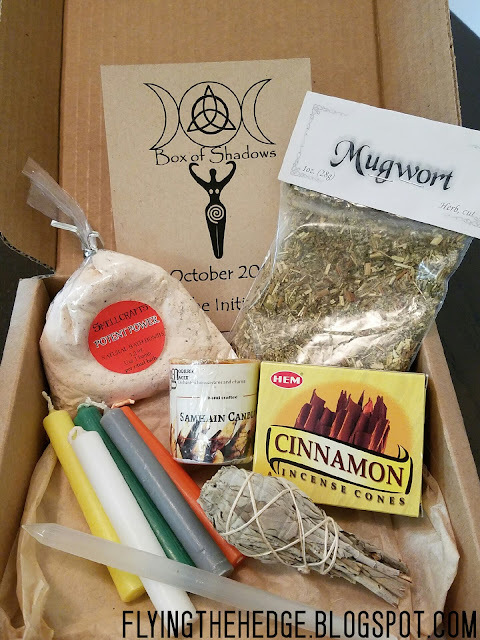 CrateJoy actually had several different pagan subscription boxes to choose from. This one looked like the best. Ooooooh yay!! I'm on the waitlist for Sabbat Box also. I should have realized there may be another option! 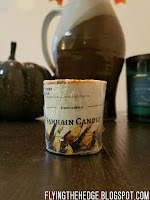 Thanks for sharing-let me know how the candle works out for you. 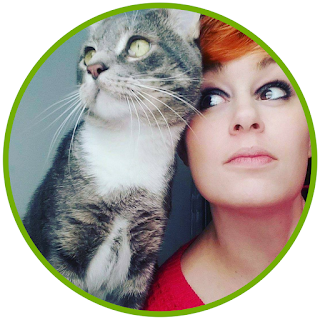 Ps: I love your cat's name! Good to know about the mugwort-esp my Male kitty Salem...he gets into Everything! Haha! Thanks! Thanatos and Osiris. Husband named them after gods of death seeing as he is a funeral director and all. I don't think I am ever going to get off the waitlist of Sabbat Box which is disappointing. You'd think by now they would be able to handle a greater number of people. We actually had a good time. The smells were a little overpowering, but it was pretty cool. I look forward to next year!